"If a solid body floats or is submerged in a liquid - the liquid exerts an upward thrust force - a buoyant force - on the body equal to the gravitational force on the liquid displaced by the body." A floating body is 95% submerged in water with density 1000 kg/m3. 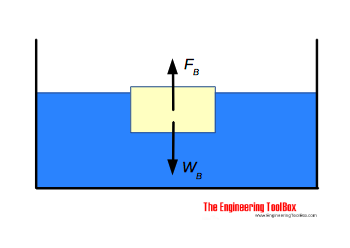 For a floating body the buoyant force is equal to the weight of the water displaced by the body. Engineering ToolBox, (2012). Archimedes' Law. [online] Available at: https://www.engineeringtoolbox.com/archimedes-principle-d_1845.html [Accessed Day Mo. Year].